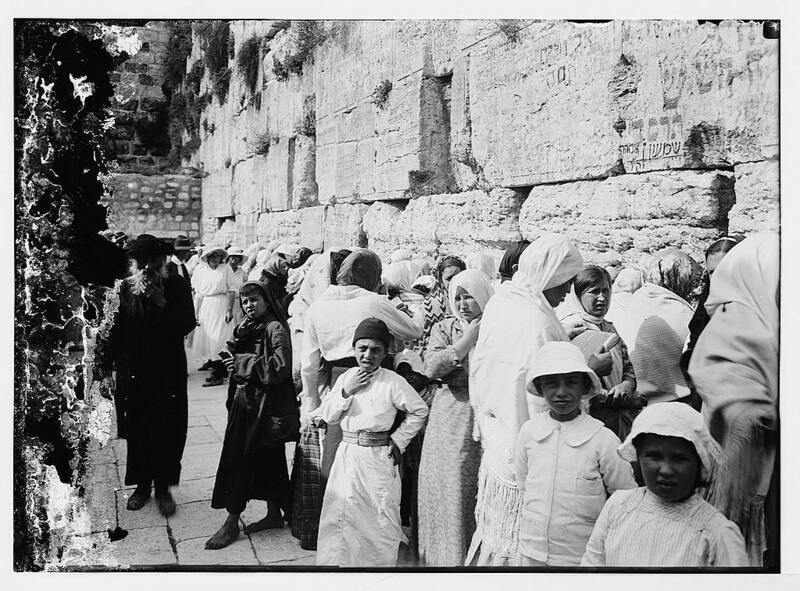 Tonight marks the 15th day of Av in the Hebrew calendar -- Tu B'Av. Traditionally, it's one of the happiest days in the Jewish calendar, commemorating various acts of reconciliation between tribes in the Bible. 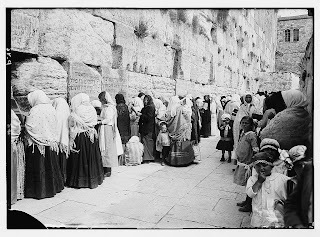 Today in Israel the day is called Chag HaAhava -- Festival of Love -- a kind of Valentine's Day. In the days of the Temple, the Talmud explained, the day was the first day of the grape harvest, and unmarried girls of Jerusalem would dress in white garments and go out to dance in the vineyards to meet their future husbands. 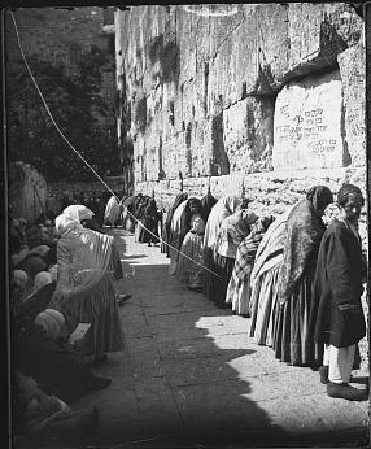 The women in these pictures were generally on the left side of the Kotel; after the 1967 war and Israel cleared the area in front of the Wall, women prayed on the right side. Because of restrictions originally imposed by the Ottoman authorities and demands by the Muslim Mufti of Jerusalem there were no physical partitions between the men and the women visible in these pictures. Any attempt to set up screens or bring chairs were met with protests and attacks. The worshippers honored a separation of sexes. The writings on the Wall are memorial notices, often with dates of the subject's death. The picture is obviously taken after the date on the wall and gives us an estimated date of the picture.